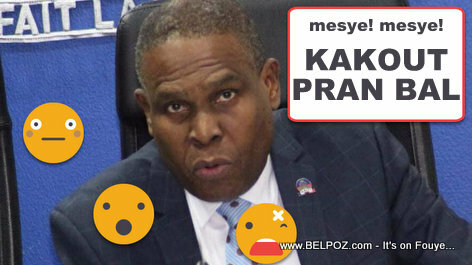 Following a bone-crushing vote to eject Jean Henry Ceant from his prime minister's seat, the former PM tells Haitian newspaper Le Nouvelliste: "I am a still a Prime Minister in office." "I do not have any current affairs to wind up (liquider les affaires courantes) because I am not a fallen Prime Minister." Henry Ceant said. "There are Deputes who have decided to do something illegal and unconstitutional and that goes against principles, republican traditions and parliamentary traditions," he said. "I am still in office as prime minister, Henry Ceant said. "I have an appointment in front of the Senate on Wednesday because the interpellation that began in the Senate must end with a vote of confidence or censorship." Bon! Se sa k te rete atò! Well I heard a lot of talk about the legality of what happened on Monday. I think he's right by saying that because the deputies acted prematurely while he was with the senators.